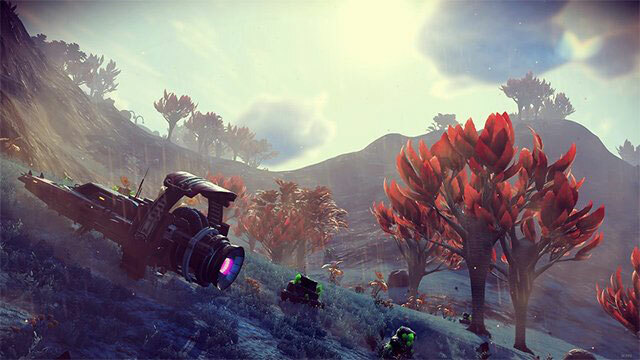 Making money is a pretty important aspect in No Man’s Sky Next. The necessity for money depends on how you decide to play No Man’s Sky Next, but no matter what you do, having a stash of units is going to always come in handy. There’s a number of ways to earn money in No Man’s Sky Next; some are better and quicker than others, of course. So, to help you out, we’re going to show you how to make units fast in No Man’s Sky Next. The best ways to earn No Man’s Sky units require some investment and leg work. There are, of course, the more obvious ways, such as completing missions. They are usually pretty low-risk, with a comparatively high reward. Another method is to purchase Frigates and send them out on missions (for more on Frigates, check out our Freighters – how to get, change, warpdrive no fuel bug article). This will earn you units for basically just waiting around for them to come back. Then, of course, there’s also grinding out or farming of valuable resources, then reselling them. Or, you can purchase wares on the cheap, and sell them elsewhere at a higher price. But those are all basics, so let’s get into the more fun stuff. One of the best and simplest ways to get rich easy in No Man’s Sky Next is to buy three S Class Scanner Modules (thank you to Reddit user Lazers02 for pointing this one out). You’ll need 400 nanite clusters per S Class Scanner Module. That’s a bit of an investment, but once you have what you need, scanning planets, flora, and fauna will get you 2-3 million units. When you come across a space station that sells S Class Scanner Modules, buy one, then save and exit. Return into the game and buy another one. Repeat until you get what you need, then get a-scannin’. Another method is to farm Larval Cores from Whispering Eggs. It sounds like a suicide mission, what with the Biological Horrors and all, but there’s a way to pull this off relatively safely and sell the Larval Cores for some good money. Once you run across an Abandoned Building with the Whispering Eggs, build square walls around one of the clusters. That will take about 160 Carbon and 40 Chromatic Metal. If you have enough materials, you can cordon of several clusters. Then, mess around with one of the clusters that you didn’t wall off. The Biological Horrors will burst out, but the Eggs in the pens you’ve built will stay put. Then, just jetpack into one of the pens and collect your loot. Do one Egg at a time, because the Larval Cores disappear fast. One more strategy that a lot of people have been using is to build and sell cryo-pumps. The one snag here is that locating the schematic is difficult, because it drops randomly. Your best bet is to search Abandoned Manufacturing Facilities, since they’re most likely to be there somewhere. Once you do, you’re going to need thermic condensate and hot ice. You can either farm them or buy them for about half a million units. It’s an investement, to be sure, but one that has a lot of return. Cryo-pumps go for about two million units, so you do the math there. Last, but not least, are Stasis Devices. They go for obscene amounts of money, but they’re also incredibly hard to find, and even more difficult to produce, because they require a ton of raw materials. It’s definitely not the fastest or easiest method to earn money in No Man’s Sky Next, but if you do manage it, it’s gonna get you a ton of money. I’ve found a pretty easy way to make good amounts of units. Search for subterranean relics. The relic itself can be sold but with each relic you get a tetracobalt. These you can refine into 150 energized Cobalt each. Energized Cobalt sells for a good amount almost everywhere.